I am using the latest driver where they changed the gain/offset settings from scale 0-63 to 0-some 590 or 600 or so (using DSO preset and the thing for affecting speed of download have set to "5" (0-63 scale) forgot how is it named in QHY driver but that's the one that affects the amount of ampglow, low value = fast readout, less glow). I believe that if you take a single dark and subtract a masterdark from it (or vice versa) you shall get a "random" noise only image (bottom left in my image) which is not the case for me. Could someone/anyone who owns QHY163m provide to me one single dark frame (no matter what duration or cooling set point, but if it is around 5 min or close to it the better - my case is 5 min at -20). You may also add one single light frame so as I can calibrate it myself and see (create the same output as on my image). the display is STF max in PixInsight (that reveals more then anything else). BTW that reminds me of a calibration issue I discovered this year, but due to zero free time I did not write a column on my old blog page yet :-( I am just saying that I recently faced myself dark frame calibration issue and resolved it (in CCD camera, not CMOS). Edited by Konihlav, 19 September 2017 - 01:44 AM. You are scaling the dark. With any camera that has glows, you must NOT scale the dark. In ImageCalibration in PI, in the master dark section, make sure you UNcheck the "Optimize" option. As long as your light and dark gain, offset, temperature and exposure length all match, then your calibration should completely remove the amp glow. Jon, thanks for your input, but it's not the case. You can download the single raw fits frames. simple subtraction. No scaling, no biases, no flats no optimization of anything, just pure two images one light and one dark. Also on the group of darks, if I create a master dark and subtract single dark I see the glow apparently (that's where the overcorrection - to black level - is shown on the test stack of 12x5min w/o flats). BTW I am using MaxIm DL for calibration (all my life). I believe my camera is (again) defect so I need to collect sources (data) from other owners of QHY163m to prove that. Thanks! I had some light leaks when I took dark with the camera covered, I now do darks in a closed closet, that seems to have fixed my dark issues. Unfortunately I don't keep my raw dark frames, but just the master integrated dark frame. I'd be glad to send you what I have (master dark, master bias, lights etc). I got some files from keithlt, but unfortunatelly his frames are not consistent - some looks like I'd expect and some have different "gradient" in the dark image. So I need more samples. As I said I kindly ask for one light one single dark and one master dark OR for couple of single darks (so as I can build master myself, 5-10 frames is sufficient). Joel - so you keep only masters and no single one frame of darks? I also delete single darks, but at least keep 3 of them for the case when you need to investigate some problem. And you never had issues with dark frame calibration? all of you who own qhy163m or asi1600 when you subtract master dark from single dark, you get clean gaussian noise? (as expected) or some of you get amp-glow shyyt like I do. No I don't keep the single darks once I have a good master. I've been using the camera for about 6 months now and I don't remember having any issues with calibration that wasn't my own fault, like mismatched gain settings between the bias and lights. The most recent images on my website were all taken with the camera. Pavel, I'm going to re-take my darks soon and I'll try to remember to send you some individual dark frames and light frames for testing. Joel - that would be great though I am sure yours will be fine and mine would remain wrong :-) my issue is so simple to prove. Just take couple of darks and create a master dark. 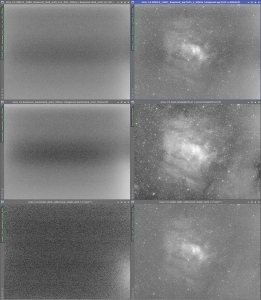 Then open single bias and master bias in that PixInsight. Open Pixel Math, expression Editor, Images, double click singlebias give minus (subtract) double click masterbias and proceed and give max STF to see result. You shall see only "gaussian" noise and amp-glow calibrated out. In my case, I do still see the amp glow. Today I managed (finally) to open a new ticket on qhy ticketing system so I wonder what I will hear back.